After spending 5 months in one place - working as a Sailing Instructor in the San Francisco Bay Area - I'm pressing the ON button for DBT Mode. For the next 6 months, I'll be homeless again, living out of a backpack and facing the uncertainty, the challenge, and the reward that comes with that choice. I leave tomorrow for Croatia, where I'll spend 6 weeks exploring by bus and by boat. Since I spent a lot of time in Croatia in 2016, this time I'll probably venture into neighboring countries of Slovenia, Serbia, and Bosnia for the first four weeks. Then I'll return to Croatia, pick up a sailboat, and sail with friends (and 8 other boats!) down the coast of Croatia, from Split to Dubrovnik. After sailing in Croatia, I'll fly to Germany for a week of trekking the Alps with good friends, capped by an evening or two at Oktoberfest. What started nearly 20 years ago as a fun vacation has now become an almost-annual ritual. It's one of the highlights of every year. Beyond that, I don't really have a plan that I'm ready to announce just yet. 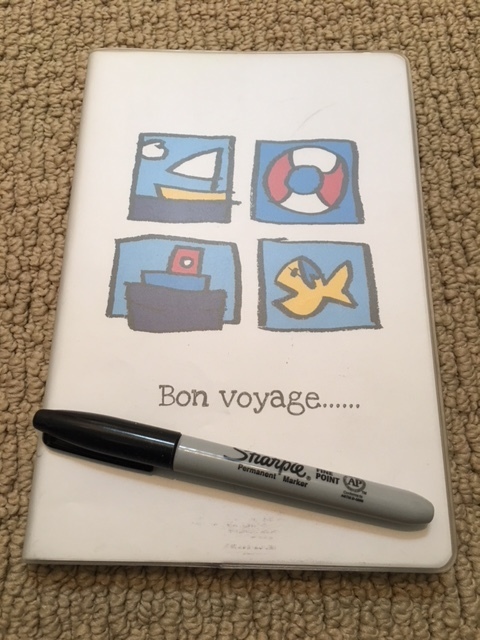 A good traveler (and good skipper) always carries a journal. My storage unit is locked, but I am free to roam the world!